With the procurement of the RQ-20A Puma AE for the first time, the U.S. Marine Corps has adopted four different small unmanned aircraft systems (UAS) manufactured by AeroVironment, of Monrovia, Calif. The service placed a $5.5 million order for Puma systems under an existing Army contract, with delivery planned in two weeks, AeroVironment reported. In addition to the Marine Corps, the Air Force placed a $2.4 million order for Puma AE systems in early April, adding the type to its earlier Wasp and Raven acquisitions. The Army placed a new $20.4 million order for Puma systems in late March. “More military services are choosing the Puma system because its longer duration and more precise imagery delivers enhanced organic reconnaissance, ” said Tom Herring, AeroVironment senior vice president and general manager of UAS. The Puma air vehicle is hand launched, weighs 13 pounds (5.9 kg) and has a wingspan of 9.2 feet (2.8 meters). Battery powered, it operates at 500 feet (152 meters) above ground level or higher, with two hours endurance. The aircraft carries a gimbaled payload with electro-optical and infrared cameras and IR illuminator. Each Puma system consists of three air vehicles and two ground control systems (GCS). The GCS is compatible with the Wasp and Raven platforms. 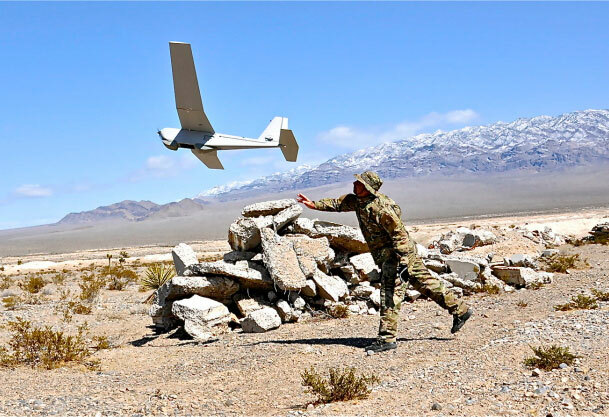 The Marines became the first U.S. military service to establish a program of record for a small UAS in 2003 with the selection of AeroVironment’s RQ-14 Dragon Eye for the Small Unit Remote Scouting System program, the company said. In 2007 the Marines ordered the Wasp micro air vehicle and in 2009 started replacing the Dragon Eye with the RQ-11B Raven. In 2008 the U.S. Special Operations Command selected the Puma for its All Environment Capable Variant (AECV) program. The Army assumed management of the AECV program last year. AeroVironment said it has delivered 1,000 Puma air vehicles.